10 Day Motorbike Excursion with the legendary Minsk 125cc! Come one ! Come all ! Ready to celebrate the moon of the New Year and welcome Spring with our ethnic friends. Please visit also our official TET FIEST TOUR website on: www.tetfiestatour.com For 16 years already, the Têt Lunar New Year tour is the opportunity for festive reunions with our friends from the ethnic minorities of North Vietnam. This trip is now an ongoing institution creating new custom. The motivation of this event is to give travelers from all around the world the opportunity to meet our hosts at a particular time in their rural lives, the New Year, but also to bring the opportunity to each of those families to meet each other as they travel with us, every day expanding our group. 20/1/2012- 2nd day. No rush this morning, the ride is easy, short and beautiful. We head toward West along the fiords of Thac Ba lake to meet our friends Tay and Dao Do (Red Zdao). HUGE FIESTA at the village up the hill in the jungle. 21/1/2012- 3rd day. Today we go up to the mountains; West along the Chay river for 50km then North until Chinese border. As we go higher the road gets smaller and sceneries wilder. It’s just pure beauty around us. We stay at Xin Man guesthouse. 22/1/2012- 4th day. If we are lucky, this morning multi ethnic market should be a big one, just before TET. We have plenty of time to enjoy this special atmosphere of TET’s eve. Then, we hit the road again, actually it’s no road but tracks. And sometimes tough ones up and down, China to our right, Vietnam to our left, and us in the middle of nowhere. Landscapes one more time are ugly with wildness to the infinite. Today is TET day. 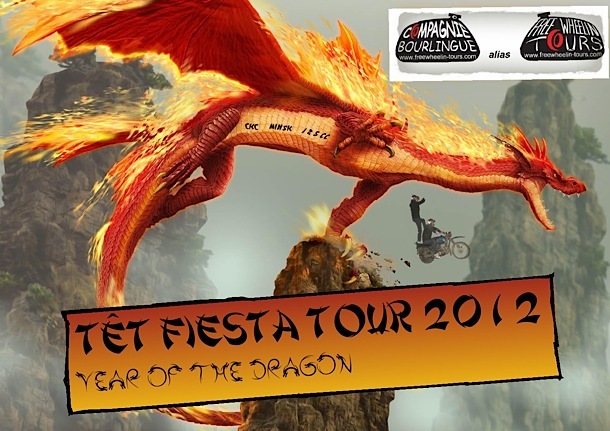 At midnight, the Dragon will eat the Cat and we will be doing FIESTA in a wild mountain circuit with our H’mong friends. Only us miles around and few neighbours from Phu La ethnic culture. 23/1/2012- 5th day. This morning, tradition wants us to pay a courtesy visit to the neighbours. Nothing better than a drink to fight the last night drinks! … and a nice walk to this sublime and untouched wildness. In the late afternoon, we will ride back to civilization- Bac Ha city and hot showers. Only 30km ride. 24/1/2012- 6th day. From one high plateau to another one, through Lao Cai, frontier city with China. Our TET FIESTA TOUR ETHNIC VERY MINORITY GROUP will certainly look strange in this international touristy place. But we will enjoy it and certainly find a good tavern to FIESTA again! 25/1/2012- 7th day. Today, mountains are high. If it’s clear, we will see the mount Fansipan, head of Indochina, only few miles from our road. We climb few pass, over 2000m and will have a stop at Sin Ho, one of the highest plateau of Vietnam. The ethnics of the mountains who meet at Sin Ho’s market are extremely beautiful and majestic. Down to Muong Lay 2, in the floating lands, we stay over this brand new artificial lake at the hotel. 26/1/2012- 8th day. As we go south, the borders to our right are not Chinese anymore but now Laotian. Long ride today through lots of pass, many different ethnics territories. Great fun motorizing through those serpentine tracks, up and down. The last part is good sealed road and rhythm gets faster. Son La city is in Thai territory on the black river. We will taste some succulent specialties of the region. 27/1/2012- 9th day. Longest ride of the tour. But easy sealed big road all the way: easy Rider style. We slowly leave the mountains to a succession of high plateau to reach the valley of Ma river, right on the Laotian border. Every Year, we try to “eat” TET with a new family, this year we are welcome in a traditional stilt house from a Thai family, right on the Ma river. They don’t have much and the benefits of the tour (if there are some) will be used to buy some equipment for the house to help them to host customers. Last stop but not least, HUGE FIESTA.